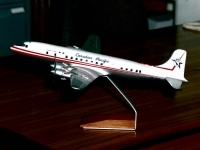 This model was offered for sale at the 2011 Schwanheim Airline collectibles show in Frankfurt Germany on Saturday, November 5, 2011. Asking price 1000 EUR. It did not sell. I-DIMA This model was offered for sale at the 2011 Schwanheim Airline collectibles show in Frankfurt Germany on Saturday, November 5, 2011. Asking price 1000 EUR. It did not sell. The smaller 1/100 KLM DC-6 also probably made by Raise Up seems to be a more accurate model than the larger 1/50 scale model. Collection owner wishes to remain anonymous.